This book helps bring the busy practitioner up to date with recent developments in research on diarrhea that has taken place over the past 10 years. The causes of diarrhea are very diverse and include infections, allergies, chronic inflammatory diseases, tumors and inborn errors of intestinal digestion and transport. The global importance of diarrheal deaths and illnessess, as well as the rapid technical advances that have occurred in this field, have generated a vast amount of literature that is not easily accessible to most practicing doctors. This single volume brings this literature together in a logical, concise and clear manner that puts diarrhea and its management into a clinical perspective. Practicing physicians, pediatricians, internists and senior students will find this book of particular interest; it will also be useful for professionals in public health, community medicine, nursing and microbiology who want a comprehensive understanding of diarrhea. Authors from Europe, Britain, Australia, and South America bring authoritative views on this subject, including its importance in developing countries and disadvantaged communities. Epidemiology and Transmission of Diarrhea (Michael Gracey and Michael Rowland). Bacterial Diarrheas (Valerie Burke and Michael Gracey). Viral Diarrhea (Geoffrey P. Davidson). Diarrhea Due to Parasites (David I. Grove). Travelers' Diarrhea (Herbert L. Dupont). The Small-Intestine and Its Role in Chronic Diarrheal Disease in the Tropics (G.C. Cook). Chronic Diarrhea and Malnutrition (Oscar Brunser, Julio Espinoza, and Magdalena Araya). Treatment of Dehydration and Oral Rehydration Therapy (Mathuram Santosham and William G. Greenough, III). Drug Therapy for Diarrhea (Michael Gracey). Vaccines and Other Strategies Against Infective Diarrhea (Michael Donnenberg and Gerald T. Keusch). 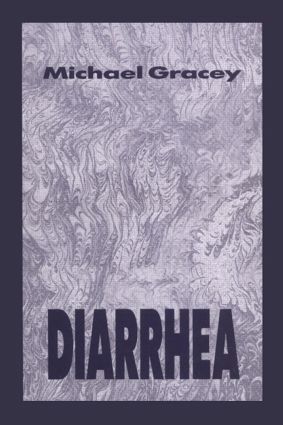 Non-Infective Diarrheas (Michael Gracey and Valerie Burke). Allergic Diarrhea (J.A. Walker-Smith). Sugar Intolerance (Michael Gracey). Celiac Disease (Geoffrey Davidson and Michael Gracey).